5.88 points at 17 votes (rank 666). 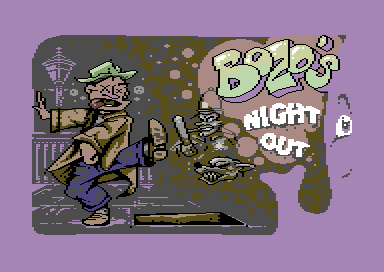 Bozo is the main character of the game Bozo's Night Out. The challenge sounds easy: you have to get out of Bozos favourite pub "Gibbons" and need to get back home. But on your way home you'll run into many dangerous situations.If you want to stay hidden, you can try to make your way trough the park. There, ghosts, dragons and other monsters are lurking around which all want to tear Bozo apart. If you prefer another way, you can take the way straight home by hitting the streets (Bozo is a neighbour of Gibbons, no wonder he's drunk every night). But be careful, the streets aren't less dangerous than the park. There you can run into hooligans, cops and grannies who all seem to dislike poor Bozo. On top of that, Bozo gets more drunk every evening, so it gets more difficult to control him. After 20 pints, controls aren't precise anymore and after 50 pints, Bozo sometimes gets unconscious and you can't control him for a short period of time. Graphics are quite decent in comparison to games of that age. There are some well made, big sprites and detailed backgrounds which look good for a game from 1984 and the horizontal scrolling (in both directions) is relatively judder free. The game is constantly accompanied by a single piece of music, which is very catchy (I caught myself humming with the tune after some minutes), sound effects can hardly be found though. 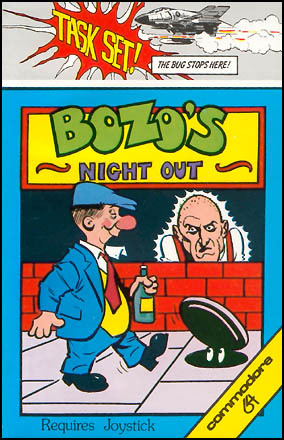 Bozo starts with 5 pints, after every encounter with a passerby or a policeman or after a fall through an open sewer hopper 1-5 pints are subtracted. 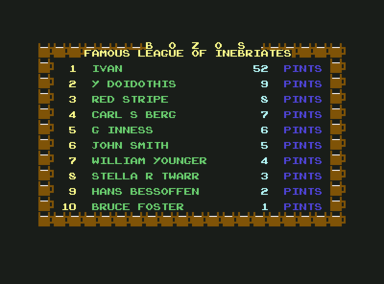 The game is over, when Bozo has no pints left, when you cancel the game yourself (2x fire button) to enter your name into the highscore list (which is not saved) or when you have reached 65 pints. Bozo finds his way home in both directions, but the way to the right is probably shorter and a bit less dangerous. 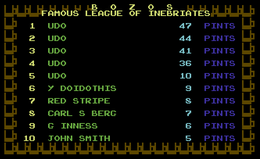 Later in the game, when Bozo starts to get seriously drunk, you should try to keep your enemies on the same screen which you are on (the program only creates three enemies at a time; if all of them are on the same screen and chase after you, no one can run into you from the front by surprise). When they are after you, wait till they almost get you, run a small distance and then wait again. This way, you can make it home inch by inch. After about 50 pints, Bozo starts to see some red elephants. Don't care about them, they won't hurt you. An animation from the game. After 65 pints even the best Bozo can't stand it any longer and the disreputable end of the game comes up. As an end title there is a picture of Bozo in hospital and the "Bozo Rotten Liver Award"
DavetheUsher: "For some odd reason I can't get enough of it. Glad I gave it a review." Werner: "This game doesn't knock my socks off. (6 points from me)"
Robotron2084: "Passaly funney... hick! ...game o' skill wi slippy music an nice colour kinnergarden graphicssss. Veeeery intenvivee... hick! ...invetnive...no...unusualal topic. 6 out offf 10 points. Cheeers!" Reinhard Klinksiek: "Nice basic idea but unfortunately there is a bit of fine-tuning missing to distinguish the game from the average. The cemetery is a funny thing, but totally useless as there is no reason why it should be crossed. Actually you can almost run through it comfortably by keeping stuck to the lower rim of the screen." blubarju: "This game is okay for 10 minutes in between, but after that it gets very boring. 4 out of 10 points from me." The +7D +PIC Version by Hokuto Force is recommended. It provides a fanmade title picture, a highcore saver and a bunch of trainers. The melody used as ingame tune was originally composed by the Czech musician Jaromir Vejvoda. In the 1930s it has become popular as the "Beer Barrel Polka" in England and - probably due to Nazi Germany's annexion of Czechoslovakia - as "Rosamunde" in Germany. This page was last modified on 21 July 2018, at 17:50.